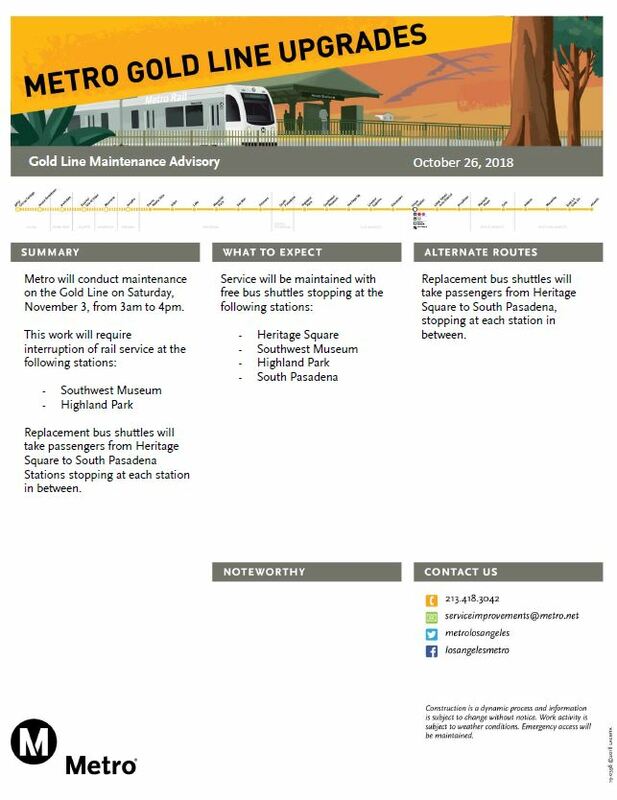 Heads up, Gold Line riders. There will be no train service to Southwest Museum and Highland Park Station this Saturday, November 3 from start of service to 4 p.m. During the closure, crews will perform scheduled track maintenance. Free bus shuttles will replace trains between Heritage Square and South Pasadena. This means all northbound trains will travel as far as Heritage Square and turn back to East L.A. All southbound trains will travel to South Pasadena and turn back to APU/Citrus. Gold Line is slated to arrive every 12 minutes while work is in progress and shuttles will match train service as best as possible. Please allow extra travel time between buses and trains. Metro personnel will be at the affected stations to lend assistance. Regular train service will resume after 4 p.m. Saturday. As always we appreciate your patience and understanding as we work to improve Metro Rail service. For the latest transportation news and service updates, follow us on Twitter @metroLAalerts. Metro Bike Share wants your feedback! Annnnnd once again, I didn’t check this website or twitter to see the service disruption on Saturday before attempting to catch a flight at LAX. Ended up driving there instead. Is there some way to post every planned weekend service disruption in the coming weeks at affected stations? I ride Gold Line almost every day and in the days before, I didn’t see or hear any notice. But I was warned over and over again to hide my phone and other electronic devices. Maybe it was on the scrolling electronic station signs, but those are often too wordy and lack readability. Anyway, thanks for what you do here, maybe station and train communications could find parity. Sorry to hear this! Notices are posted at affected stations the week prior, and are also on station screens. Audio announcements also should have been made over the speakers at regular intervals. If this was not your experience, please email CustomerRelations@metro.net the details of your trip and what you encountered so staff can help follow up.